To buy a gift for the sophisticated dad, we must first establish the qualities and attributes that separate them from other dads. Sophisticated as defined by the dictionary means – “Having, revealing or preceding from a great deal of worldly experience and knowledge of fashion and culture.” Therefore, the sophisticated dads think they are very different from the dorky dad, even if it’s only a delusion of sophistication, because let’s face it, all dads are dorks in some way at least. Its part and parcel of the job. 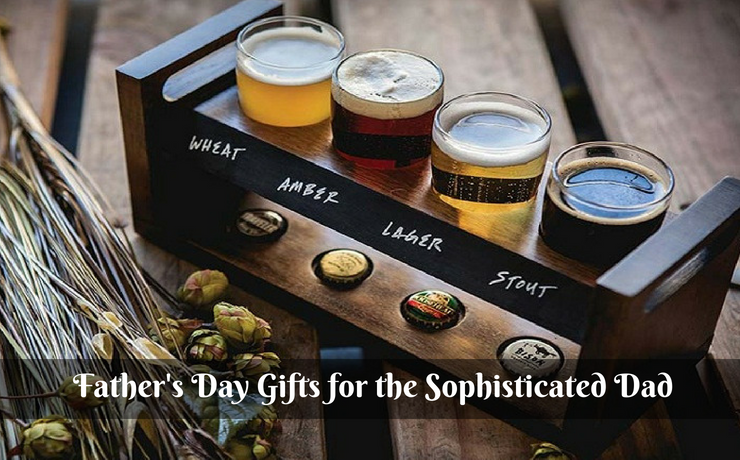 So when it comes to Father’s Day, why not humour his delusion by buying a sophisticated gift hamper for the sophisticated dad. In this post, we will try to give you some suggestions catering to the sophisticated dad. The sophisticated dad is usually connoisseur of the finer things in life. He can be seen sipping a glass of red wine while contemplating the works of Carl Jung. Obviously, he is going to need somewhere to store his extensive collection of worldly wines and what better place to keep it than a wine rack. The sophisticated dad likes to challenge his mind and will do so by partaking in activities that push his mental capacity to the point of exhaustion. A chess board is an ideal gift as he and his buddies play long games of chess while sipping on red wine from the wine rack. He will sit pondering, stroking his stubble, plotting planning his next move to hopefully obtain victory and indulge in the spoils of defeating his opponent. A sophisticated dad usually dabbles in extracurricular arts-related endeavours and considers himself to be a man of culture. Whether your father is an artist or a wannabe artist, painting supplies will be a welcome treat, so when he is in his downtime he gets lost in the art of pushing paint around the canvas. Painting is a great past time for the sophisticated dad to appreciate and unwind from the stresses of the daily grind. A man of fine taste can often be found in the kitchen toiling away, searching for new techniques and flavours to excite his ever-expanding palette. To do this he needs the right tools and some quality kitchen utensils will be a welcome addition to his arsenal and provide him with weaponry to whip up a storm in the culinary crusades in his own mind. The sophisticated father enjoys the finer things in life and the Gourmet Gift Hamper is jam-packed full of the finest wines and treats available, sending him to other places far beyond the imagination as he describes the characteristics of the wine. He will also try and guess the ingredients of the fine nibbles and sweet treats that are all beautifully wrapped in this gorgeous gourmet hamper. A man of the world needs to drink worldly drinks and this hamper will transport him on a world beer tasting tour. It features beer boutique beers brewed locally and abroad along with gourmets treats to chow down on while enjoying a coldie on a hot summers afternoon. Or any afternoon for that matter. Johnny Walker Black optimises sophistication and has long been a leader in the whiskey game. The sophisticated dad knows this and has been using it as his fuel for countless years. The sophisticated dad sits in his favourite chair with a whiskey on the rocks pointlessly swirling his glass so he can hear the clink of ice cubes against the glass. These dulcet tones are music to his ears the soundtrack to sophistication. Although these hats look ridiculous and offer no sun protection or practical application they are favoured and adorned by so-called sophisticated chaps. They can be seen on the weekend, sipping on coffee reading the paper or a classic novel at your local coffee shop sporting trilbies and wire-framed glasses. They sit cross-legged and often scratch upon their chin to signify their intelligence. Little do they know that from the perspective of an outsider they look like nothing more than a dorky dad. But we won’t tell them that now will we? We should though. This is the bible for the sophisticated, worldly dad. He can often be seen reading this publication to keep up on worldly issues. And if you are unlucky enough to be walking past when he is reading he will bore you to tears with a travel story from yesteryear where he and his friends travelled Vietnam on motorbikes. So when buying for the sophisticated dad, think worldly, think culture, think philosophy, think anything that will fuel his delusion of not being a dorky dad. But to all around, immediate family to passers-by know that deep down he just a dweeb in the twilight of his glory days.